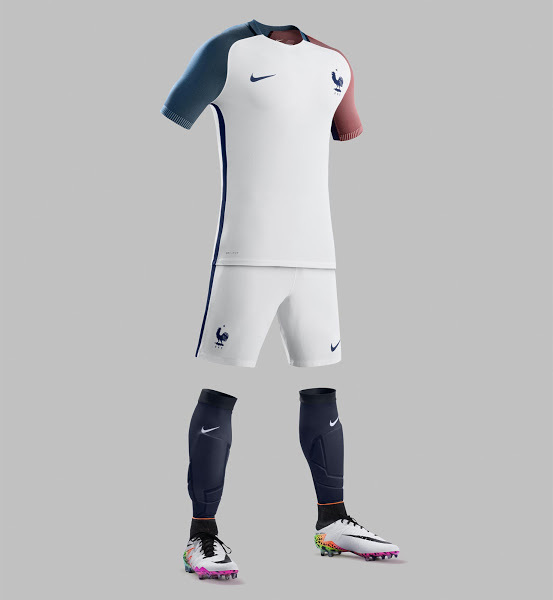 The all new kit of France for Euro 2016 championship have been released. 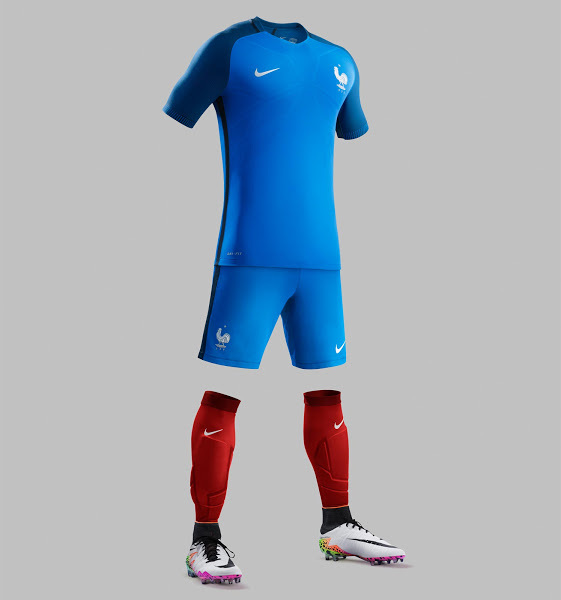 The hosts will be wearing new kit in Euro 2016 designed by kit supplier Nike. France, when we hear about the country along with each & every detail of the country, the one wonderful feeling we will have in our mind is their football team. Well time is moving forward and unless we have a time machine, we will only see them in modern jerseys every year. The 2016 kit is ready and “amazing” of course. The home kit comes in cobalt blue colour, special knit zones in chest as well as right under this, create a parallelogram pattern. The dark blue colour of sleeves are created by cross dyeing black and blue gives a good looking shape as well as a dynamic look to the jersey. A black line or stripe runs all the way from the sleeves to the bottom of the blue shorts. The socks for home come in red colour. The word “FRANCE” is knit on to the collars, where as “fierte” which means pride and “bleu” which means blue are knit on to the cuffs. 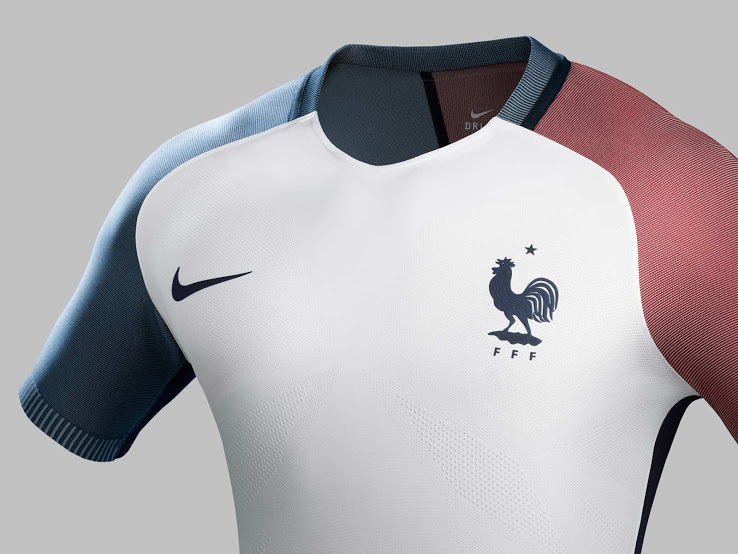 All together NIKE has done a great job in creating a well fit and amazing home kit for France. As we come to the away kit, it looks like even more hard work has been done. The away jersey comes in as a combination of three different colours: White,Red and Blue. Resembling it to the French national flag. The body of jersey comes in white colour where as left sleeve in red and right sleeve in blue. A black or rather navy blue coloured stripe is added from the sleeves to the bottom of the white coloured shorts. The socks are added to the jersey in a different black colour which in turn matches perfectly to the stripe. NIKE’s both home and away kit looks perfect on the players but as we know kit’s are not only about uniformity or looking good. It’s also a factor that influences the movement, freedom and thereby the game of each players. NIKE have promised that they have created something so good that players won’t have any trouble because of their kit. Well,knowing their cutting edge precision and technology there is no place for doubts. And so, the kits are ready and everything in place. Now let’s just hope that they have got a treat awaiting us on the field. 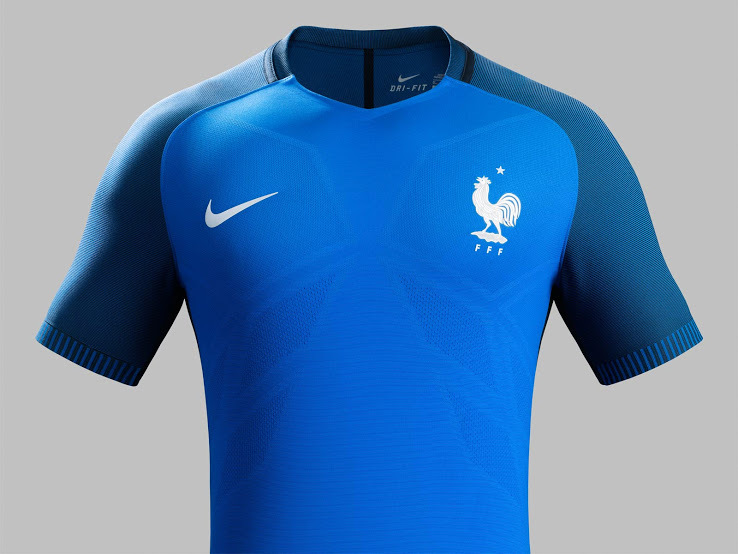 So how much you like these new Euro 2016 kit of France?